A small project I have been developing with volunteers at Bristol Reconnect, the ACE Project (St. Paul’s) and the Northern Slopes Initiative has today taken a small, but significant step. 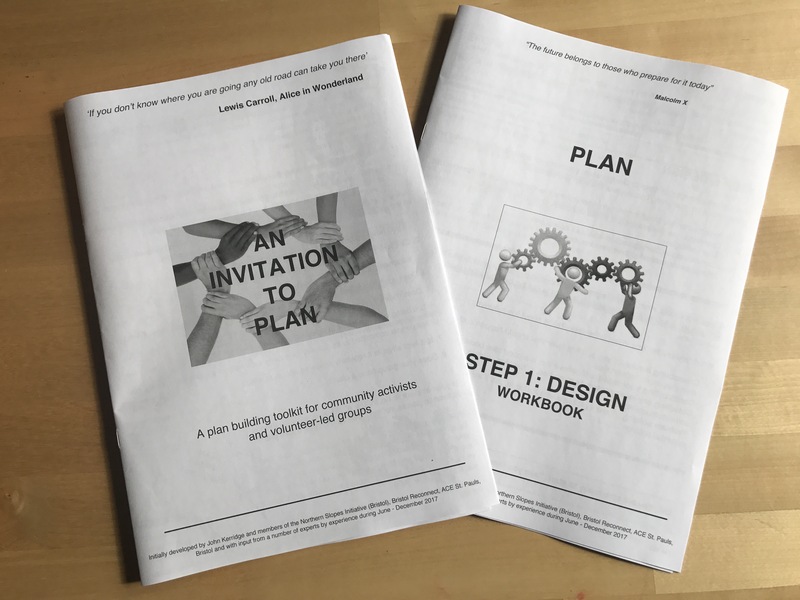 The printing and publishing of our first workbooks, which are expressly designed to help small volunteer-led (and often unfunded) groups to plan more efficiently. The books are intended to help these types of groups to deal with the challenge of austerity, especially when the local government comes knocking on their door asking them to get more involved in the delivery of services and facilities. There will be more to share in the never future for those who might be interested in these rather mundane, but important matters as we develop the next 6 workbooks and the overall support programme. In the meantime, my gratitude and respect goes out to the volunteers in these projects who are working with some of the most vulnerable people or defending essential community facilities in the city. You might be considering the establishment of a community group, social enterprise, community interest company or charity. You might even be an established group wishing to explore an update to your existing constitution. You will have several options to consider, but one thing is certain many groups tend not to study this issue until it becomes necessary. Let’s face the fact; not many people get out of bed to engage their valuable time and energy in these matters. I will work with you to explore the various models, including and support you through the appropriate registration process. These matters may indeed be boring, but essential and in most cases the issues are not rocket science with most people being able to grasp the important issues. My approach will be to dive deeper into what you are currently, what you intend to be doing in the future and how you intend to do it. One of the easiest things for any consultant to do is simply pull a model (template) constitution of the shelf and fill it in for you. If this is what you want then you can find links to these templates at the helpful links and resources page. My working approach is to listen carefully to your needs and help you in the design and building of governance that is fit for purpose.